I’ll frequently go long periods of time without the time and/or motivation to update my mods, and like any mod author, there’s no guarantee that I won’t drop off the face of the internet someday. However, the last thing I want to do is leave a mod orphaned to restrictive permissions or the expectation of my blessing for its use. Permissions for this mod are open: you can upload this mod to any site, make changes to and/or publish separately any aspect of the mod, or publish altered versions of the the complete mod under your name, no credit required. Please do not derive payment, through crowdfunding or otherwise, for recognizable redistributions or edits of this mod. All graphical assets in this mod have been adapted from Bethesda’s marketing and in-game assets. Treat them as you would any other asset from the base game. Permissions are open - anyone who wish to use part or whole of this mod in their own creations is welcome to do so. SU’MMER is a gameplay expansion for Skyrim with a comprehensive purview and unique ‘universal’ design philosophy. SU’MMER introduces new game mechanics, restores old ones from previous Elder Scrolls games, and balances out existing ones. It does this all while maintaining maximum compatibility with other mods, and allowing the player to customize almost every mechanic it introduces. In Skyrim, the best defense is usually a good offense, and timing counts for next to nothing. Against the game’s flailing, predictable foes, heavy weapons suffer little from their slowness, blocking is a dull affair, and dual-wielders and spellswords must resort to button-mashing and kiting to end fights before defense is needed. Marksmanship particularly provides an irresistible advantage against the game’s bumbling AI opponents, which has sent countless diverse and promising Dragonborn down the well-worn path of stealth archery. Parrying opens up defensive options to dual-wielders and spellswords, and helps to balance the strength and staggering power of two-handed weapons by penalizing their sluggishness and predictability. Swing a weapon or fist within an instant of your opponent’s to block their blow, staggering the opponent and mitigating the damage you receive. Timed dodging provides a high-risk/high-reward alternative to blocking, and increases the pace and mobility of combat. Tap the sprint button while moving sideways or backwards with a fist, weapon, or spell raised to dodge, prompting a brief window where you are invulnerable to damage. Dodges utilize unused animations from the base game. To make timing more urgent during archery, stamina will drain and the screen (and controller) will shake while drawing bows or loading crossbows, making aiming more difficult and encouraging careful shot timing to conserve stamina. 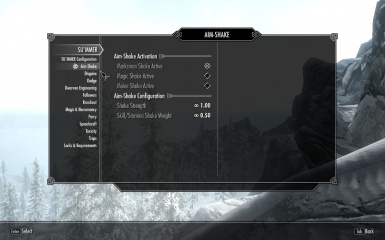 Shake strength is configurable, and is optionally extendable to spellcasting and melee weapons. Moreso than previous Elder Scrolls games, Skyrim suffers from a lack of spell diversity, with old favorites and even generic staple spells having disappeared, only to be replaced by boring gradations of fire/ice/shock/healing spells. 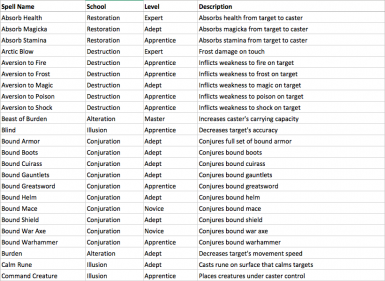 While Skyrim brings a number of interesting new magic archetypes to the table, a great many of them are available to the player only as shouts. Legacy spells bring back the best of Morrowind and Oblivion, including Alteration spells like Jump, Slowfall, and Mark & Recall, Conjuration spells summoning classic bound weapons and armor, Destruction spells that drain attributes and resistances or inflict pure magicka damage, and Illusion spells that silence enemies’ casts and provide Sanctuary against incoming blows. 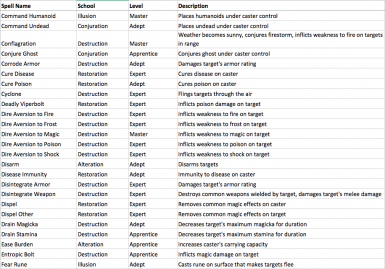 Restoration may have benefited the most from the addition of classic stat and resistance buffs, reflection and absorption spells from the deprecated school of Mysticism, and offensive spells that afflict the living with poison. 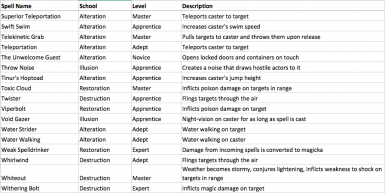 New spells draw on Skyrim’s expanded palate of shouts and scripting advances to create entirely new playstyles for mages. Fling opponents through the air and distract them with suspicious noises, teleport through space and manipulate time, change the weather at will, and bring dead allies back to life. 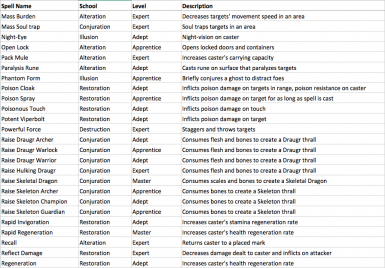 These spells are presented in as lore-friendly a way as possible, and will particularly benefit those who roleplay non-Dragonborn characters using mods to disable the main quest, but still wish to use the powers afforded by shouts. Necromancy has always featured prominently in Elder Scrolls lore, but been essentially indistinguishable from any other form of Conjuration in practice. Now, you can harvest flesh and bones from the deceased to use in new spells that raise undead thralls which never expire and don’t count toward your summon limit, allowing you to lead an army of the dead, including Draugr, Skeletons, and Skeletal Dragons. At the end of the day, stealth in Skyrim boils down to an exercise in staying out of sight when you’re outgunned and abusing sneak attack multipliers when you’re not. A skill with no bar to entry and little sense of progression, lockpicking makes it possible for any meat-fingered brute with enough lockpicks to crack ancient chests and reinforced doors alike with minimal patience and no training. Pacifists who prefer not to kill will find their preferences better-accommodated, as foes can now be knocked out with a fist, shield, special spell, or the blunt of a weapon. Unconscious foes can be looted and dragged, and will revive after a random period of several hours or when struck by a weapon or spell. Foes wearing certain armor may be invulnerable. Lockpicking requirements prevent you from cracking locks above a configurable skill level, so practice is now essential for thieving characters. Not to exclude anyone, mages who invest in Alteration will have access to new lock and unlock spells that scale to their skill level, and even pure warrior types will be able to smash simpler locks with enough force from a weapon. Each approach to opening locks confers experience to the appropriate skill, and level requirements are completely configurable. Beyond securing better prices and ensuring success in the few minimally-consequential persuasion opportunities sprinkled throughout the game’s quests, Speechcraft offers few advantages in the way you interact with the world. Additionally, pacifist characters are essentially out of luck in the merciless world of Skyrim, where downed enemies proclaim their submission before popping up to stab you in the back. Contextual persuasion opportunities open up new gameplay options and even personalities to the player. Beg for money while wearing ragged clothing, rob passers-by while you weapon is drawn, or instigate a brawl with your raised fists and an insult. Be careful how you use these tools though; powerful characters may see through these threats and attack preemptively, and weak ones may be so intimidated that they sound an alarm against you. Pacifists will also now find that downed foes actually yield. Slightly-less-pacifist (or just more-pragmatic) characters will find that these foes can also now be robbed for their equipment, recruited as followers, or told never to show their faces again, useful if they’re the target of a bounty or assassination quest or seem too eager to stick around your newly-liberated hideout. You can now recruit multiple followers and animals, up to 7 of each (3 by default). You can also set a maximum party limit that applies jointly to followers and animals. As your party grows, you will learn shouted commands that can direct all your followers in a growing radius simultaneously. Beyond grinding for perks and resources, crafting has little to offer in combat. Crafting progression is reflected only in other armor and weapon skills, and hours sunk churning out iron daggers are regularly invalidated when you level up and start finding gear made from more powerful materials. 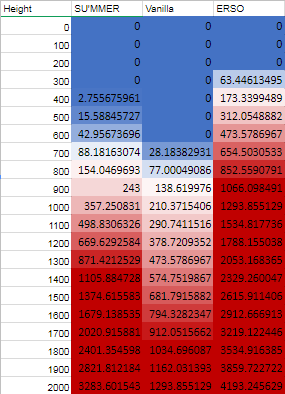 The mechanics of potion consumption also fundamentally imbalance combat in favor of the player. With minimal advance planning and the ability to pause time in menus, you can grind your way through most enemies by slugging down any number of potions whenever your stats dip. Traps placed throughout the game world, such as bear traps, pressure mines, and tripwires, can now be crafted, picked up, and deployed at will. New recipes make it possible to enhance traps with offensive properties, such as frenzy, paralysis, or good-old-fashioned explosions. For more academically-minded smiths, the remnants of the Dwemer civilization laying about Skyrim’s ruins can now be used to craft portable Dwarven Automata, including Spiders, Spheres, Ballistas, and Centurions, which can be stored in your inventory and deployed in combat. For non-enchanters, this offers an alternative sink for the hundreds of otherwise-useless soul gems you acquire in your travels. An optional module with a few gameplay adjustments that play well with the other modules and that serve to offset some of the benefits afforded by the new features, but that edit too many aspects of the vanilla game to merit inclusion in the main mod. Speech checks are harder, and now tend to require a skill level matching the 'Novice/Apprentice/Adept/Expert/Master' system, so you'll be more persuasive after hitting level 25, 50, etc. While many of these features exist in other mods, SU’MMER offers a polished and coherent all-in-one gameplay package, and was made with a particular design philosophy that emphasizes adaptability over all. While it looks similar on the exterior to other large-scale gameplay mods, its execution makes it different under the hood. While SU’MMER will expectedly step on the toes of any mods that add similar features, it alters very few vanilla records and will play nicely with most other mods, even ones that change game settings, perks, AI, and more. Conflicts with most mods (generally, those that add new player animations, edit traps, or edit the default Follower system) can be resolved by loading the preferred mod lower. While SU’MMER is calibrated to better balance the vanilla game and reward skill development, players who dislike the limitations it applies have the ability to customize almost every feature to their liking. Configuration is conducted through a SkyUI MCMenu. This page also allows you to distribute SU’MMER’s added items throughout vanilla leveled lists so that added content will appear throughout the world, without baking into your save from the moment you load. There are also one-click options to test any individual feature by adding SU'MMER's spells, perks, items, and disguise-compatible armors to your character. SU’MMER is a lore-friendly mod that makes nods to previous Elder Scrolls games while improving the changes that Skyrim has made to their formulas. 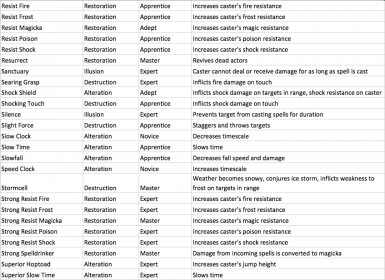 Most of the included spells are ripped straight from the lore of previous games, and those that aren’t fit in through naming conventions and the use of vanilla assets. New assets for objects like bound armors, portals and Dwarven Automata recycle existing assets, and will even be affected by texture replacers. Perhaps the least visible feature from the player’s perspective, I hope this aspect of SU’MMER will make a difference on the durability and adaptability of the mod, and will serve as a proof of concept for other modders. Most mods that add gameplay elements make use of player-centric scripting that cannot be extended to other actors without adding complex quest-based tracking systems. SU’MMER takes the opposite approach and refuses to assume that its additions are running on the player (barring intrinsically player-centric systems like dialogue, screen and controller effects, and skill advances) - many of its effects could be implemented on NPCs by simply giving them a new perk or spell. It's my hope that this design choice will open up new ways for SU’MMER to interact with mods like ASIS and Ether Dynamics Advanced AI that expand existing game systems to NPCs, and online multiplayer mods like Tamriel Online and Skyrim Together that decentralize the player’s role in the world. Download through your Mod Manager or manually, ensuring that 'SU'MMER.esp,' 'SU'MMERecalibration.esp,' 'SU'MMER.bsa,' and 'SU'MMER.bsl' end up in your Skyrim/Data folder and are activated in the launcher. YOU MUST USE THE MCM IF YOU WISH TO SEE SU'MMER ITEMS IN THE GAME WORLD. To maintain compatibility, this mod makes no direct edits to the game's leveled lists. To distribute SU'MMER items like spell tomes, staves, scrolls, traps, and dwarven automata throughout the game world, open the MCM, choose 'SU'MMER Configuration,' check the 'Distribute SU'MMER Items' button, and close the menu. You will receive a confirmation message onscreen when the script is done distributing the items. If using any mods with competing features, load them below SU'MMER and deactivate the conflicting feature in the MCM. For dodge, trap, and multi-follower mods in particular, it should be enough to let the competing mod overwrite the animation trees, trap activators, and DialogueFollowerQuest respectively - these are the only vanilla forms touched by the main mod. If building a merged patch, exclude SU'MMER if you want any features to be overwritten - all edits to leveled lists are triggered at runtime anyway, as described above. Users who experience conflicts with other follower system mods should download the optional "SU'MMER No Followers" file. Load the .esp below SU'MMER and above any other followers mods. Some mods may be compatible without the patch when loaded after SU'MMER. If you wish to test individual features, you can use the testing functions in the MCMenu to add items, perks, and spells from the mod directly to your character. Almost every feature of this mod can be customized to user preference. For a detailed list of options available, see the 'Images' section, which showcases the majority of options available (images were captured with v0.1, though few new configurable features have been added since then). The MCMenu provides access to debug modes that will print notifications to the screen so that you can see what the main scripts are doing for each feature. Try to reproduce the bug with the debug feature on and note any messages that appear irregular in the comments, i.e. repeatedly or with illogical values. This is a problem with the engine. Save with the plugin loaded then re-load and they should start appearing. Additionally, it may be that dialogue conditions or priorities are preventing them from showing up. Make sure that your clothing actually has the 'ClothingPoor' keyword if trying to beg (vanilla clothes with this keyword include the Ragged Robes, but not the 'Roughspun' items - the Unofficial Patch adds it to several other clothes as well). If brawling and robbery options don't appear, it may be due to quest priorities or scenes. All new persuasion attempts are set to medium (50) priority and will not run during scenes, so they may not be available when certain quests are running or certain characters are interacting. This visual bug can occur on the first time casting Bound Armor spells, but will usually resolve itself by removing and replacing the armor, recasting the spell, or reloading. Alternatively, this may be due to an interaction with an ENB or texture replacer. This only occurs for certain items (just the Fur Gauntlets, as far as I know) due to the way that their slotmasks were set. It would be outside the scope of this mod to edit a vanilla item record for compatibility, so this will remain as-is, as it only occurs on a small minority of items. 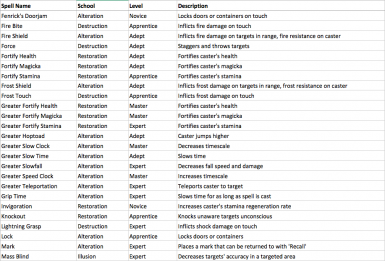 Kryptopyr's 'Weapons and Armor Fixes Remade' purports to solve some of these issues, though I haven't tested it myself. Make sure you don't have another dodge mod installed that is overwriting SU'MMER's edits to the animation trees or triggering other actions through the 'Sprint' button that may be interfering with dodging. Due to the scripted processing of dodges, this feature is also susceptible to framerate problems: if you experience significant script lag or cannot run Skyrim at a framerate of minimum ~20 fps, dodging animations may not play properly. Users who have problems with this may want to deactivate the 'Dodge' feature and use a Script-Extender based alternative like TKDodge﻿. This generally occurs due to problems with script lag. While the scripts handling aim-shake have redundant checks to ensure that the screen only shakes when it's supposed to, users who run many scripted mods or have low framerates may experience this issue - it can generally be solved by drawing another arrow and firing. SU'MMER uses a dialogue tracking system built into a vanilla quest to support multiple followers without having to make edits to all followers dialogues, which would be detrimental for compatibility. Due to the way this is implemented, followers may misunderstand which command is meant for them if you exit dialogue quickly after giving multiple commands in a row, and talk to multiple other followers before they acknowledge the command. If followers' dialogue options are disappearing or commands are not processing, attempt to use the 'Reset Followers' feature in the MCM, then re-recruit your followers. If this issue is persisting from an earlier version after you update, try using console commands to reset your followers' factions and AI packages before you re-recruit them. I have observed this bug infrequently in my own testing, and haven't found a single way to prevent it. This can usually be mitigated by waiting several seconds after dropping the container or deploying the automaton before interacting with it again. Turn on the debug mode for the relevant feature, note what messages you see, where, and when, and post a comment here.